Kate Pritchett currently performs with the Oklahoma City Philharmonic and the Lawton Philharmonic. In recent years, Kate performed regularly with the Dallas Opera Orchestra, the Richardson Symphony Orchestra, the Garland Symphony Orchestra, and the San Angelo Symphony Orchestra. She plays period instruments with early-music groups such as the Orchestra of New Spain. She has also played with Colorado’s Greeley Philharmonic and the Christchurch Symphony Orchestra of New Zealand. Kate recently completed her DMA in horn performance at the University of North Texas. She received her Master of Music in horn performance at UNT, and her Bachelor of Music from the University of Northern Colorado. She has studied with Bill Scharnberg, Bill Bernatis and Jack Herrick. 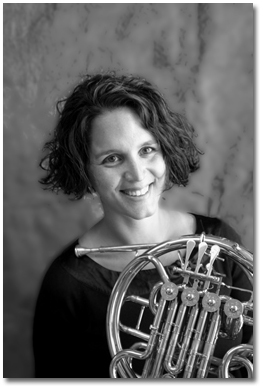 Kate is the instructor of horn and music theory at the Wanda L. Bass School of Music at Oklahoma City University. She has also taught at the University of Texas at Arlington and at Texas Woman’s University, as well as at the University of North Texas as a teaching fellow. In addition to her work at OCU, she teaches a private studio of middle and high school students, and works with younger students in clinics and master classes in Texas and Oklahoma. Kate has performed on several recordings of the University of North Texas Wind Symphony, including a performance with the Newcastle Brass Quintet on Convergence, a CD released in 2001.